ANSI India offers you a range of countertops made in Granite, Marble, Slates, Sandstones, Limestones, Mosiacs and so on to give you the look that you desire & the durability that you deserve. Natural stones are an ideal countertop surface with a multitude of one-of-a-kind color choices and the durability to withstand everyday use. Natural, Durable & Beautiful. Granite is one of the most durable natural stone surfaces, perfect for the kitchen or bath. Every piece of granite has its own unique pattern, making each surface one-of-a-kind. 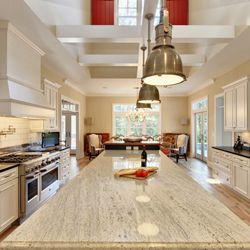 Granite countertops provide uncompromising beauty and elegance, and are naturally durable and easy to clean. Natural granite is a material with naturally occurring variations in color, tone, granularity and pattern; no two stones are exactly alike.As mentioned, many people all over the world are now using granite as a surface for their counter tops, such as in their bathrooms, kitchens, and even mantelpieces. Of course, when it goes into the construction of counter tops in homes and buildings the granite is usually polished, which is the method of cleaning and polishing it that gives it the shiny and modern look for homes and buildings. In addition, granite can come in a variety of colors, which is also yet another reason why individuals choose to use this for decoration in their homes. Granite is one of the most popular surface choice because of its durability and overall pleasing beauty. Our premium granite selection offers a huge range of granite colors patterns. We have the perfect granite countertop for your project whether your granite countertop needs are for your kitchen, bathroom, or other surface.